Uses : Basil herb is diaphoteric, anti periodic, stimulating, expectorant and anti-catarrhal. It is used in malaria, catarrh, bronchitis and gastric disorders. It also lowers blood sugar levels and its powder is used for mouth ulcers. 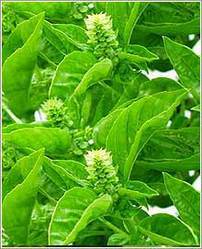 Basil herb is widely worshiped in India. It is an aromatic herb and is often used in potpourri and sachets. The cosmetic industry uses basil oil in lotion, shampoo, perfume, and soap. It is also used in some skin ointments and promoted as a treatment for acne.